It's been quite a while since I had a grab of my camera for a nature shoot. It's just that I have been blessed with lots of stuff to do at work. Hopefully I will be able to have another photo shoot once I get the perfect time. We are actually planning of spending the Christmas Holidays out of town and I will try to at least take a picture of the place. I am also thinking of buying a new DSLR but I am still working on stretching my budget for that. Here is one photo that I took few months ago at Clark Freeport Zone, Pampanga. 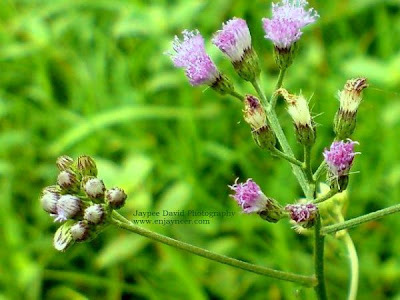 It's a weed from the lawn which turned out to be a beautiful subject because of its lovely lilac flowers that stood out from the green grass. Weeds aren't supposed to be useless after all.